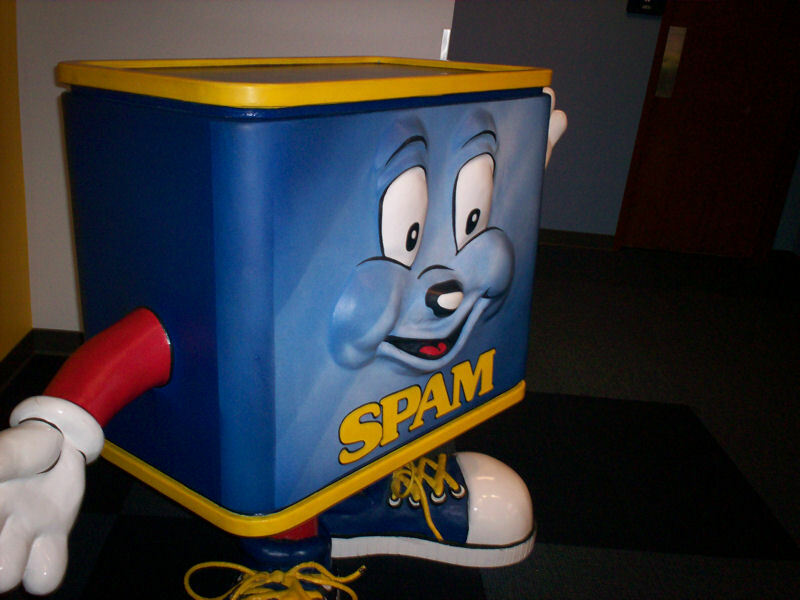 Our 2006 Road Trip, Part 12: Spam! Spam! Spam! Spam! « Midlife Crisis Crossover! 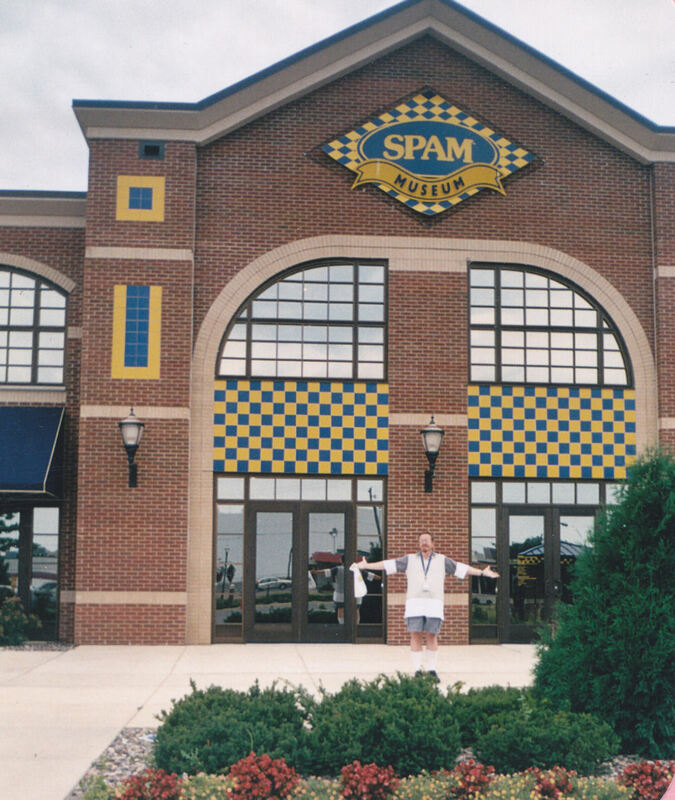 Our 2006 Road Trip, Part 12: Spam! Spam! Spam! Spam! 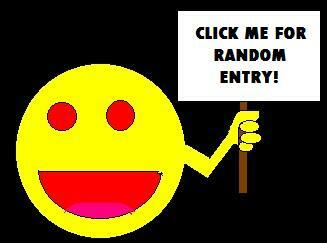 Spammy bids you welcome! Enter freely and of your own craving! After several hours of gawking and photographing the animals, then a few minutes of fairly priced zoo cafeteria lunch, two more hours of driving took us southeast to the town of Austin, home of Hormel Foods and the world-famous Spam Museum. 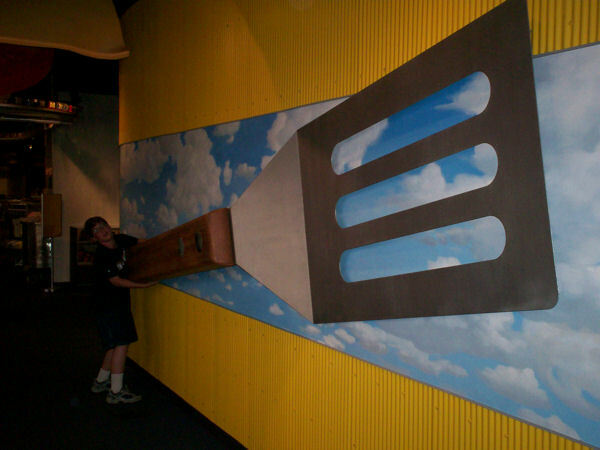 With no admission fee or remote pretense of dignity, the Museum is an uncanny blend of pop-art decorum, tongue-in-cheek send-ups of other museums, and straightforward historical account of the birth and growth of a foodstuff. 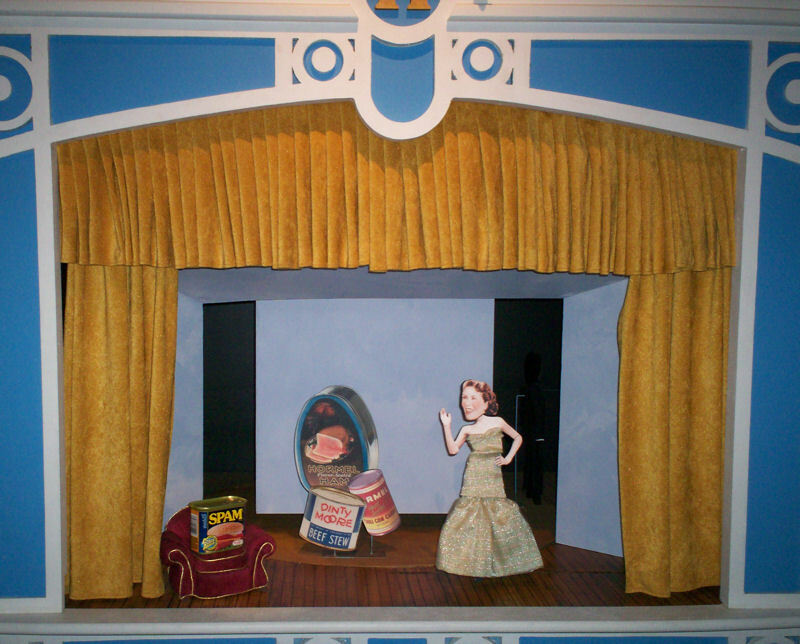 Learn from animatronic figures and voices how the founder of Hormel Foods determined to leave the company to his son and move to California! See hints of the ingredients and the thought processes that led to their eventual transformation into that thing called Spam. Hear some Burns ‘n’ Allen radio routines as they flirt and advertise Spam! Read a letter from Dwight Eisenhower recognizing the role Spam played in feeding servicemen! See the Monty Python Spam sketch as many times as you like! 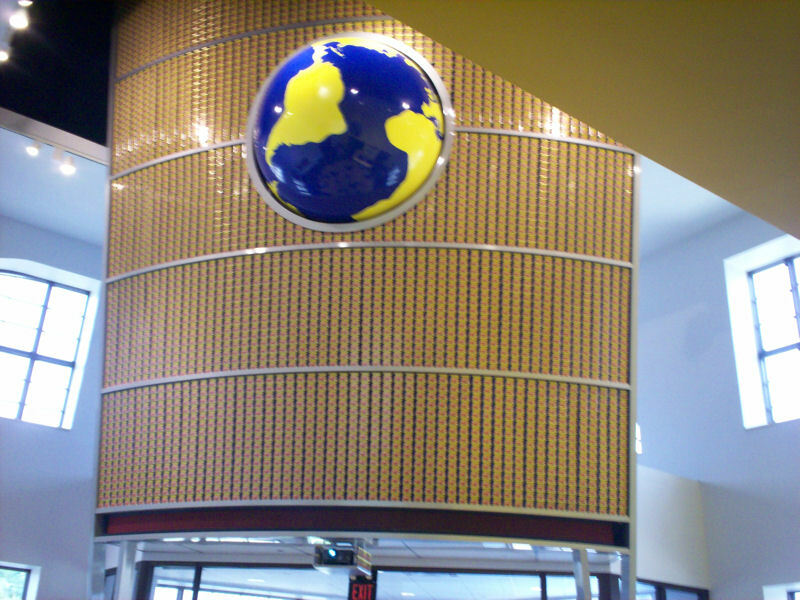 Behold the wall built out of thousands of Spam cans! The wall above the front desk. Yes, those are individual cans, not a Pop Art painting. 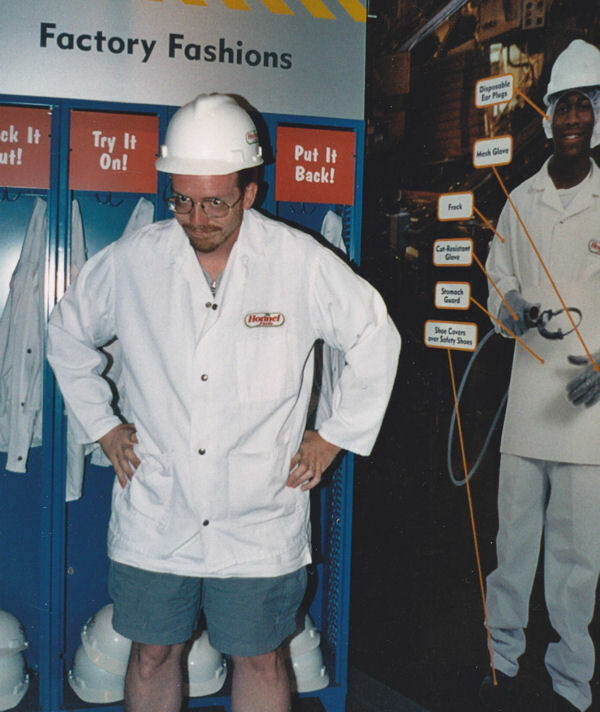 You can dress up in Spam factory uniforms. You can practice your assembly-line skills and improve your Spam-can manufacturing time. Remember, kids: Spam manufacturing safety is no laughing matter! If factory machines can demolish a T-800 from the future, just imagine what they can do to you. You can sit in a theater and watch a featurette about other Spam fans, including a ladies’ singing group calling themselves the Spamettes, singing songs like “Mr. Spam-Man” and “Out-of-Spam Blues”. Naturally included as additional background music was Weird Al Yankovic’s R.E.M. parody, “Spam”. If those aren’t captivating enough, there are dramatic puppets. My son blanched at the collection of old equipment used to “handle” the live product, such as butchers’ knives and abattoir meathooks. Yet he remains a stalwart meat fan. If he’s learned anything from me, it’s to embrace his dichotomies. …we’re gonna need a bigger can of Spam. 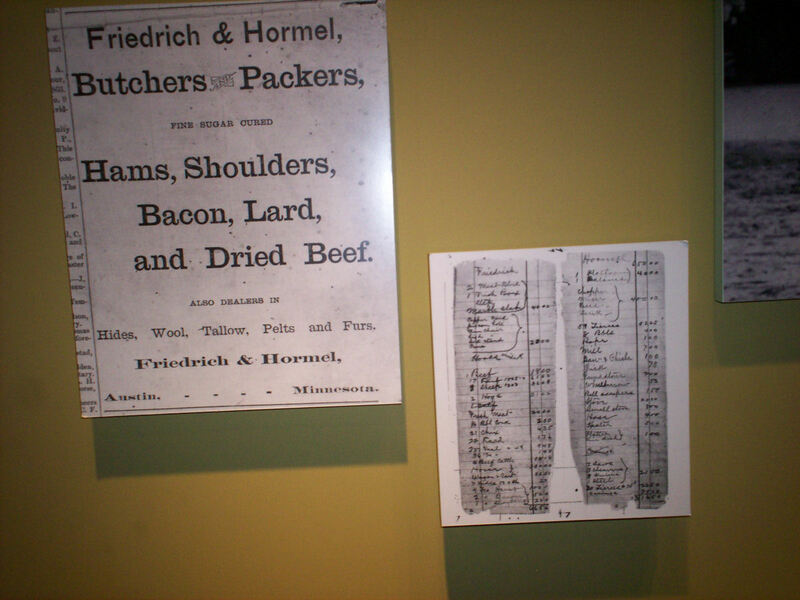 The only exhibit that reeked of straightforward, unironic corporate overreach was the section devoted to other Hormel products, shaped exactly like your grocer’s refrigerated section, stocked with nothing but Hormel products, but devoid of any museum-based narrative or context, or any of the museum’s otherwise prevalent sense of humor. Their gift shop is nearly the size and breadth of a Disney Store. In addition to everyday cans of Spam (including doubly-priced Spam in commemorative Monty Python cans), you can also buy Spam-based clothing, knickknacks, kitchen tools, children’s toys, linens, and other household products. For his souvenirs, my son settled for a snack-sized Spam packet and a tiny stuffed pig in a Spam shirt that we named Spammy. The Spam Museum! All this and Spam, too! 1. According to current headlines, plans are afoot to move the museum away from its cozy I-90 spot and closer to downtown Austin, thus encouraging tourists to spread the tourist-dollar love around, instead of just Spamming and running.